(From left): Dr. Vijaya Melnick, H.E. 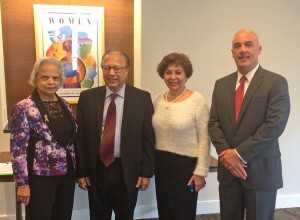 Ambassador Anwarul Chowdhury, Dr. Sorosh Roshan, and Dr. William Latimer. This past October, Dean William Latimer, professor and founding dean of the Lehman College School of Health Sciences, Human Services and Nursing, delivered a compelling and significant speech at the United Nations. He discussed Tanzania, one of the largest African nations with a population of almost 50 million people that also has one of the highest maternal mortality rates in the world. Dean Latimer presented Lehman College’s proposal for an important new educational program that will directly help to address this crisis and has the potential to reduce maternal mortality for the millions of women living in rural Tanzania. His speech was an integral part of the International Health Awareness Network (IHAN) conference at the U.N. on October 28. The new program in partnership with the Hubert Kairuki Memorial University (HKMU) in Tanzania will be called “Advanced Practice Nursing with Emergency Obstetric Care Specialization for Tanzanian Nurse Midwives Serving Rural Areas. “This program has great potential to rapidly improve access to skilled obstetrical care and primary care services for rural women in Tanzania, thereby moving Tanzania closer to achieving Millennium Development Goal number five—goals established by the U.N. in 2000—to reduce maternal mortality and universal access to reproductive health care,” said Dean Latimer. The Lehman program, which they hope to have in place by September 2015, will enroll ten Tanzanian nurse midwives at the school’s two-year advanced practice nursing program with a specialization in emergency obstetrical care (EmOC.) Those nurse midwives will earn a Master of Science degree in the Family Nurse Practitioner track. After graduation, they will commit to working three years as nurse midwives and trainers in rural Tanzania. The difference they can make will be enormous: Only 42% of births in these rural areas are attended by skilled practitioners. Through the program these highly skilled nurse midwives will act as educators for other midwives in rural areas when they return to Tanzania. Another major goal is to incorporate and develop an advanced nursing practice curricula at HKMU that will help significantly increase the number of nurse midwives throughout Tanzania.